Author: Dreyer, Eileen Set In . . .
Forensic nurse Chastity Byrnes is trying to put the past behind her. It has been ten years since Chastity exposed her father for the monster he was. Ten years since she made the accusations that shattered her family and sent her into exile. Ten years since she's seen her sister, Faith. Now, though, Faith needs her help. Chastity gets a call from Dr. Max Stanton, the brother-in-law she never knew she had, to tell her that Faith is missing. Max begs Chastity to come to New Orleans to help him find her. And even though Faith was the one who deserted Chastity so long ago, Chastity goes. To find her missing sister, Chastity has to battle her own demons in a city where forensics are an old boy's club and a woman can find trouble in her sleep. She has to wade through distrust and deceit to get to the truth, whether she wants to hear it or not. She has to rediscover the sister she lost by investigating fertility clinics, the powers of St. Roch, and the mysteries of voodoo. She has to discover why women who might have helped her sister are dying. 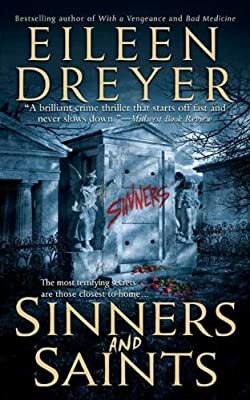 A searing portrait of family secrets and betrayals, Sinners and Saints is Eileen Dreyer at the top of her game.